I’ll be honest: the title is an oxymoron. Automating posts to social media sites isn’t very “social” at all. 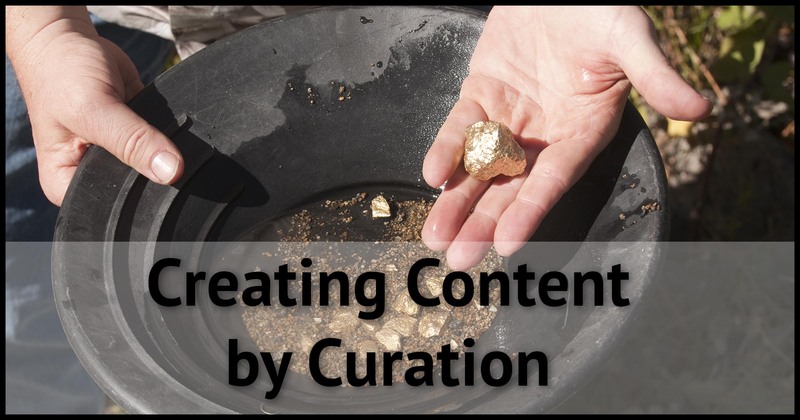 But sometimes, it’s the most pragmatic approach to getting your content in front of the people who want it. As part of Not All News Is Bad, I elected to automate posting the daily entry to its Facebook page. Let’s look at the thought process that lead me to this decision, and the mechanics of how I set it up. Automated posting to social media is downright controversial. Depending on who you ask, it’s either blatant deception, a valuable service, or somewhere inbetween. The issue is that people expect social media to be all about people. People reading posts, people interacting with posts, and, perhaps most important of all, people creating posts. There’s an assumption of intimacy; interacting with someone’s Facebook posts has the feeling of a one-on-one or small group conversation. Of course, that intimacy is a facade. While some people live and breathe social media, the majority dabble, dropping in and out as convenient. Couple that with social media algorithms that may or may not show you everything you’ve signed up for, and the firehose of social media posts and commentary, and you realize it’s just not that intimate at all. Folks in the “it’s deception” camp feel that automated posting from some other source, like a blog, is misleading because the expectation is that someone will be there to read and respond to comments or other interactions resulting from the post. In reality, the poster may rarely even log in to the social media platform, treating it like a pure publishing platform and letting the automation result in a one-way “push” of information. Folks in the “it’s a service” camp appreciate having the information published to their preferred platform. If I spend time on Facebook, for example, it’s convenient for me that publication X posts there, as I can consume that content on my terms, within the scope of the social media platform’s abilities. Needless to say, I lean toward the latter, as long as there’s no intent to deceive. As a publisher with a limited number of hours in the day, interacting deeply with all the social media platforms I might publish on is a non-starter. If I made it a requirement, I’d publish in fewer places, and fewer people would be able to choose whether, and how, to access my stuff. As a result, I provide my information, via automation, on multiple platforms that I may, or may not, interact with directly. I discussed Not A News Is Bad (NANIB) in a previous post. It’s a curation of good news, with one story published daily. More explicitly, it’s a citation of a story published elsewhere, with a little commentary on my part indicating why I think it’s special. The intent of NANIB isn’t to become a business (though I’ve added sponsorship information and opportunities), but to provide an alternative voice bringing light to the good news stories that are getting lost in the flood of attention-grabbing negative and political headlines of the day. Social media plays an important role. In fact, NANIB started as a daily personal post on Facebook before I got the idea to step it up a notch. That “notch” automated much of the publication process, and enabled email notification, but removed it from Facebook without additional manual intervention. That’s where automation steps in. I’m going to assume you have a basic understanding that an RSS “feed” exists (if you’re on WordPress, then your domain name + /feed is likely your RSS feed – for example, http://notallnewsisbad.com/feed – it’ll look like computer code if you examine it). I’m also going to assume you have a Facebook page set up, though that’ll be less important, since the technique I’m outlining will work with other social media targets if you choose to post elsewhere. Step one is to create an account at “If This Then That”, or “IFTTT”: https://ifttt.com. 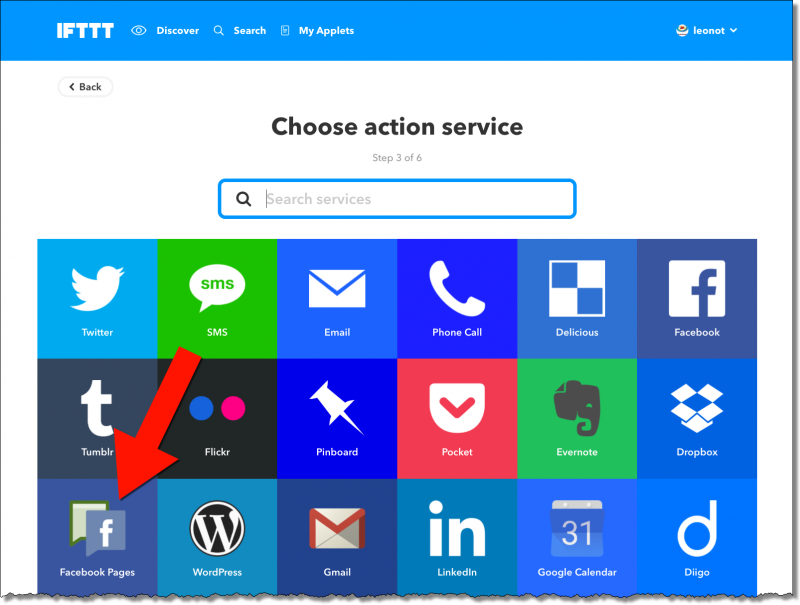 IFTTT is a powerful yet easy-to-use service that allows you to build “applets” that connect triggers – the “this” part – to actions – the “that” part. The entire service is built around the model that if “this” happens, then do “that”, for an amazingly wide collection of this’s and that’s. Once you’ve created your account, click on your account name in the upper right, and click on New Applet. Click on the big blue + this, which will take you to the “Choose a service” page. On this page, you’ll choose what the “this” will be. 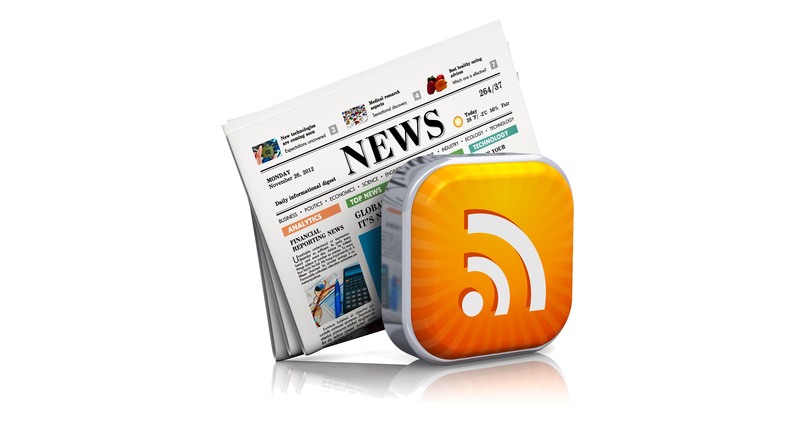 Since we’re going to trigger on our RSS feed, click on the Feed button. You may be asked to “Connect” the RSS service to your account. Do so. With a Feed as an input, there are a couple of things that you can do. All we want here is the simplest: when something new is posted to our site, something new will appear in the feed. Click on New feed item. 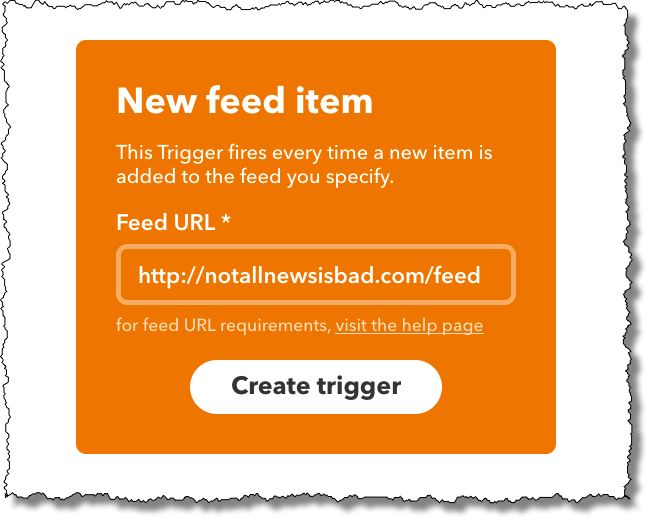 “New feed item” is where you specify the URL to your website’s RSS feed. In my case, that’s http://notallnewsisbad.com/feed; yours will be different. This brings us back to the top level of our “if this then that” definition. The “this” is now accompanied by an RSS icon, and the “that” is now blue. We know what to trigger on; it’s time to decide what to do next. Click on + that. As you can see, there are many, many different services you can use. For our purposes, however, click on Facebook Pages. 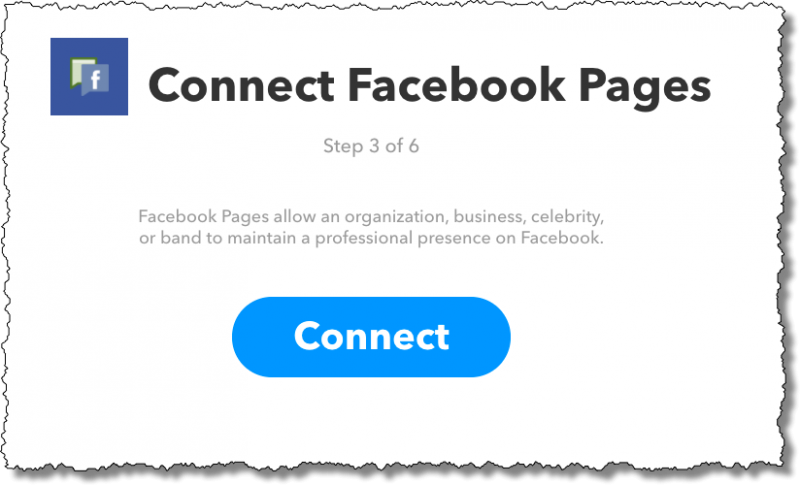 If you haven’t before, you’ll be asked to “Connect Facebook Pages”. 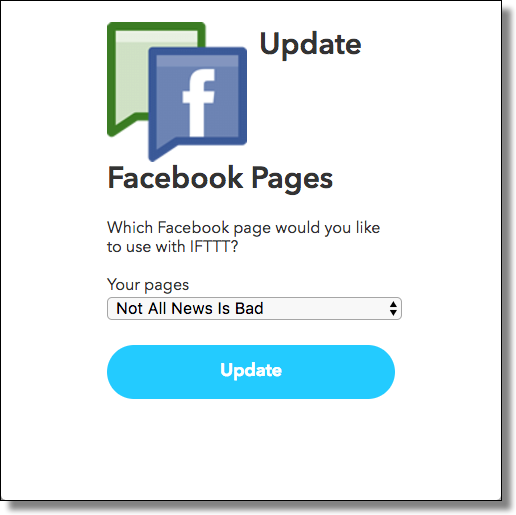 Click Connect, and you’ll be asked to log in with your Facebook credentials to give IFTTT permission to access your account and your pages. You may then be presented with a choice of which page to connect. Within Facebook Pages, there are several different types of things we can do. What I wanted for Not All News Is Bad is a link back to my website, so I clicked on Create a link post. 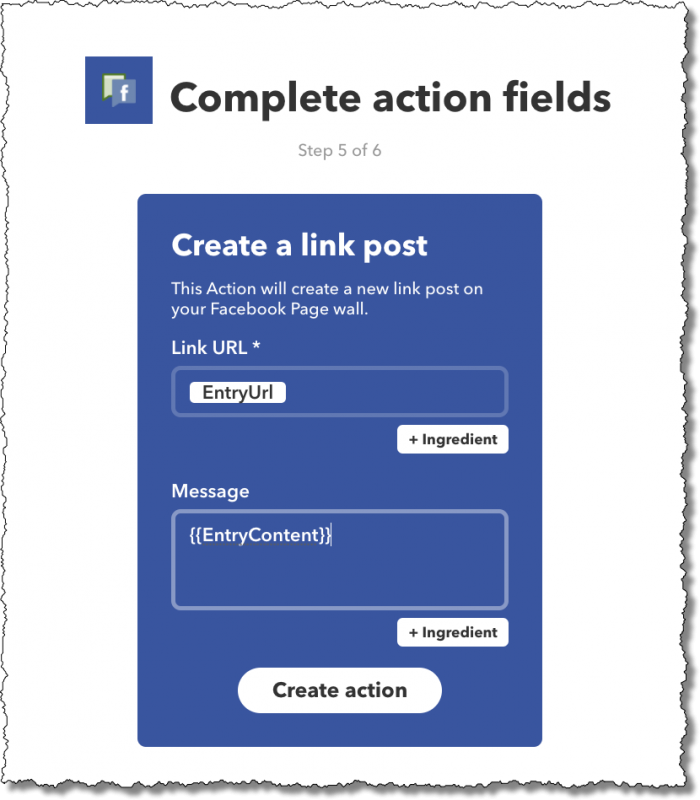 This next step allows us to define exactly how a link post should be constructed. In the example above, I’ve left the Link URL field alone; it defaulted to the right thing. I’ve added to the Message field by clicking on + Ingredient and then Entry Content. This will place any comments I’ve added to my post as the message to go along with the posted link to NANIB. Now every time a new post is published on http://notallnewsisbad.com, the RSS feed is updated, IFTTT will “notice” within some short amount of time (it’s undefined, but typically well within an hour), the applet will run, and the link post will be created on the Not All News Is Bad Facebook page. As you may have seen by the list of possible actions, there’s a lot you can do with IFTTT each time a new post appears in your RSS feed. 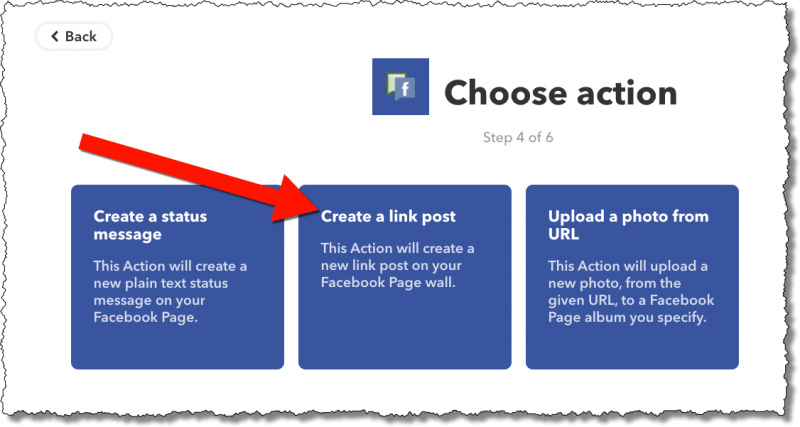 I’ve chosen to post to Facebook, but you could just as easily post to Twitter or some other social media service IFTTT supports. It’s totally up to you and your understanding of where your audience is, and how you can best add value. If you want to do more than one – say both Twitter and Facebook – just repeat this process a second time, or more, specifying a different action each time. 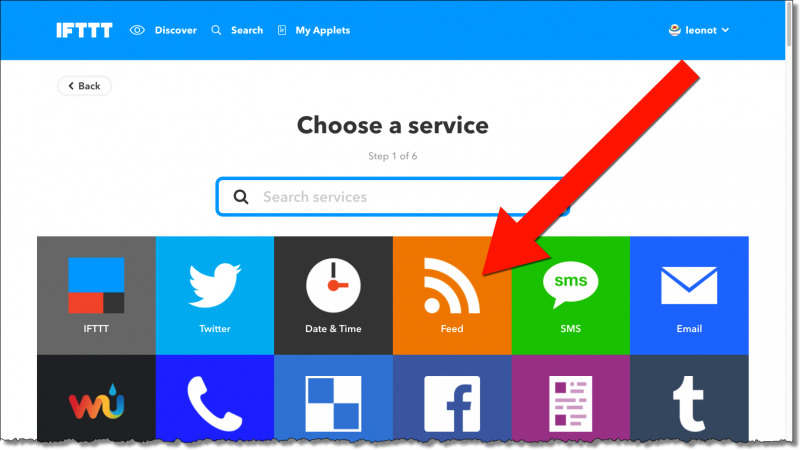 Unfortunately, IFTTT doesn’t support absolutely everything, nor does it support doing just anything you can think of on the services that it does support. However, the basics are amazingly powerful, and can allow you to add some incredible value to your site and for your audience. 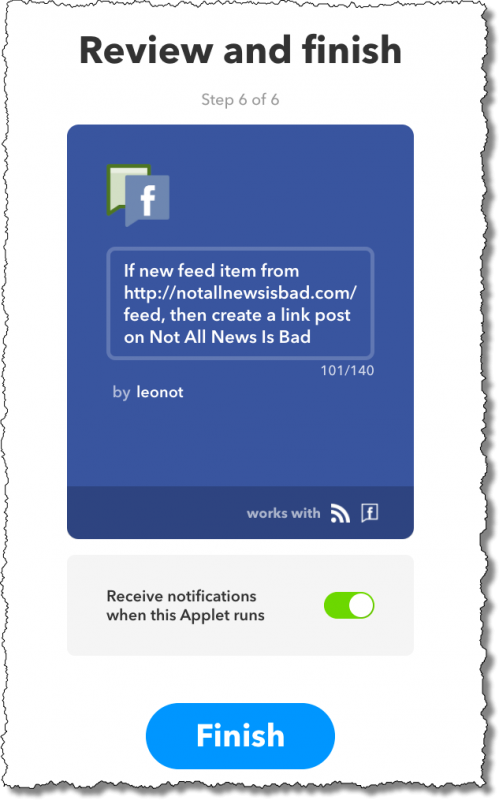 Important: IFTTT is able to associate only one Facebook page with each IFTTT account. If you administer multiple Facebook pages for which you want to use IFTTT you’ll need a completely separate IFTTT account for each.